The OM-DAQLINK Series has been discontinued. Please see the OMYL-M90 and OMYL-M90E as a possible alternative or contact our Data Acquisition Engineering Department. With built-in temperature and humidity sensors, plus four external probe inputs the OM-DAQLINK Series standalone data loggers ensures a low cost, reliable and accurate solution. The OM-DAQLINK data logger is a 16-bit, mobile data acquisition device for continuous indoor or outdoor data monitoring. The OM-DAQLINK Series is comprised of two data logger models, measuring a broad range of parameters on four external inputs for direct measurement and recording of PT100 RTD, J/K/T thermocouple, 0 to 1 V, 4 to 20 mA, contact, frequency and pulse sensors, as well as internal temperature and relative humidity sensors. With its high resolution and fast Analog to Digital converter (ADC), OM-DAQLINK Series data loggers meet the majority of data acquisition requirements in most industrial applications. Every OM-DAQLINK data logger is embedded with a unique serial number and can be loaded with a descriptive comment for safe identification. An internal clock and calendar keeps track of the time and date of every sample measured. OM-DAQLINK Series data loggers can automatically activate external alarm events when data is outside a specified range. Email and SMS notifications can be sent to predefined contacts. 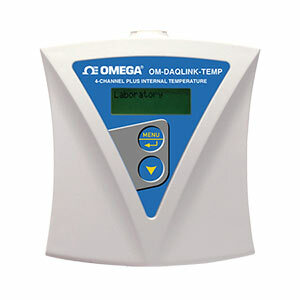 The OM-DAQLINK Series includes two data logger models OM-DAQLINK-TEMP and OM-DAQLINK-TEMPRH. These data loggers support up to four external sensors and two internal sensors: internal temperature (OM-DAQLINK-TEMP and OM-DAQLINK-TEMPRH) and internal humidity (OM-DAQLINK-TEMPRH only). Data is recorded and stored to the data logger's internal memory and transmitted over the network to the DataSuite software running on the PC. The data logger is programmed to consume as little power as possible during operation, in order to conserve the battery life. When not transmitting or recording data the units are in sleep mode and they wake up when needed. The battery for the OM-DAQLINK-TEMP and OM-DAQLINK-TEMPRH is rechargeable and can run up to several months on one charge, depending on the logger configuration (battery life depends on the logger sampling rate, transmission rate, type of sensor, and number of measured sensors). OM-DAQLINK Series data loggers use the powerful DataSuite software. The Windows® based software is the central management interface of the OM-DAQLINK Series. When connected via USB cable to the PC, the data from the OM-DAQLINK data logger can be monitored online and displayed in real-time graphs or tables. Analyze data with various mathematical tools, or export data to a spreadsheet. The software also enables you to configure, calibrate or update the firmware of OM-DAQLINK Series data loggers via direct USB connection. DataSuite provides one software platform for a wide range of Omega products in addition to the OM-DAQLINK Series data loggers, such as the OM-DATANET Series wireless modules and the OM-MICROLITE and OM-MICROLOGPRO portable, standalone loggers. DataSuite lets you monitor and compare data from multiple systems in a singular, uniform view. with export to Excel and CSV formats. Real-time, online data in multiple displays (Graph, Table, Statistics, Sensor View). Alarm level setup with email and SMS notifications. Four alarm levels, allowing for programming of 4 separate parameters, with alarm delay and duration. The Report Module provides the OM-DAQLINK user with an intuitive interface for creating and generating reports which have many parameters garnered from the OM-DAQLINK data logger and software. Each report can be emailed to a selected distribution list, at predefined time intervals, in PDF and Excel format. Dew point analysis, FO Pasteurization, histogram, MKT, statistics with export to Excel and CSV formats. 참고: Comes complete with universal 110/220 Vac power adapter and NIST calibration certificate. DataSuite software and USB interface cable are sold together as a separate package (OM-DAQLINK-SOFT) and are required to operate the data logger.